Sunday, and it's raining. A day in the motel didn't appeal to me so I plugged "Gold Coast Breweries" into google to see what happened. Three popped up. One in is Nerang. It's owned by Carlton and boasts being one of the largest in the country. One is in Burlieh Heads just down the road, but they only open 10am to 4pm week days. If they didn't want me to go, all they had to do was say so. 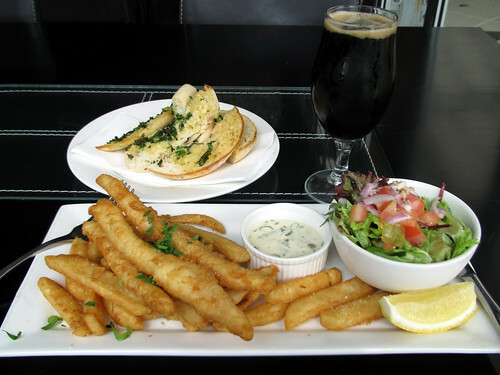 Beer batter fish and chips, garlic bread, and Cockatoo Dark Larger. mmmmm. The brewery complex contains a Restaurant, a Pub, and a cheese Factory. So after stuffing my face, I bought a six-pack sampler and a block of cheddar. Evenings at the motel won't be so boring. dewhitton said:"One is in Burlieh Heads just down the road, but they only open 10am to 4pm week days. If they didn't want me to go, all they had to do was say so."